Lunch is reserved for meetings, technology makes us available anytime, anywhere-and somewhere along the way 9-to-5 morphed into 24/7, and technology makes us available anytime, anywhere. Our demanding schedules crowd out what matters most: family, friends, even our faith. Although it may feel like you're living under the Big Top, take heart. You don't have to be a circus professional to keep all the plates spinning. Pat Gelsinger understands this challenge. As a prominent executive in the Silicon Valley, Pat struggled to juggle a thriving career with his family. Pat's pursuit of balance led him to dynamic truths that revolutionized his approach to life. 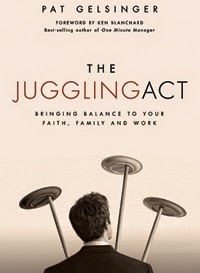 Take a meeting with The Juggling Act. And get your professional-and personal-life on the fast track to success. Mr. Pat Gelsinger is a Senior Vice President for Intel Corporation and is its first ever Chief Technology Officer. He has over 20 years expereince, 10 patents and numerous publications. As CTO he is responsible for setting the long-term research and technology directions for Intel. he frequently speaks at industry conferences through-out the world. In addition to his technology career, Pat speaks regularly on the subject of balancing priorities in many settings (including many for Campus Crusade for Christ). He also serves as an elder and regular Bible study instructor in his church. Pat has been married to his wife Linda for 20 years, and they have four children: Elizabeth, Josiah, Nathan, and Micah. They live in Beaverton, Oregon.